Arkansas Sen. Missy Irvin of Mountain View (left) visits with UAMS Chancellor Cam Patterson, M.D., MBA; Cancer Institute Interim Director Laura Hutchins, M.D. ; and Dorothy Graves, Ph.D., Cancer Institute associate director of administration, during UAMS Day at the Capitol. 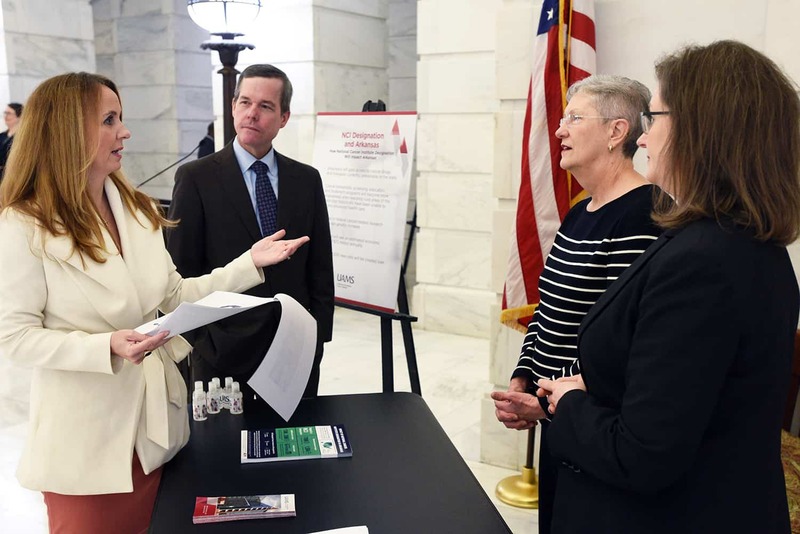 March 26, 2019 | UAMS Day at the Capitol on March 26 gave lawmakers a firsthand look at how the state’s only health sciences university impacts citizens across Arkansas. 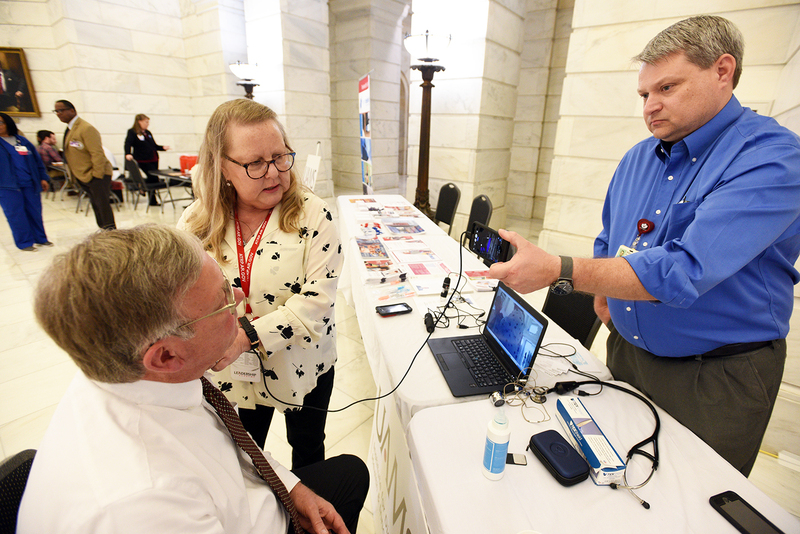 Booths displayed in the Capitol rotunda highlighted a variety of UAMS programs and colleges, in addition to providing free biometric health screenings to legislators, visitors and Capitol staff members. “Not only is this a chance for legislators to learn about UAMS’ mission to improve the health of Arkansans, it also gives them a quick and easy way to keep an eye on their personal health,” said UAMS Chancellor Cam Patterson, M.D., MBA. 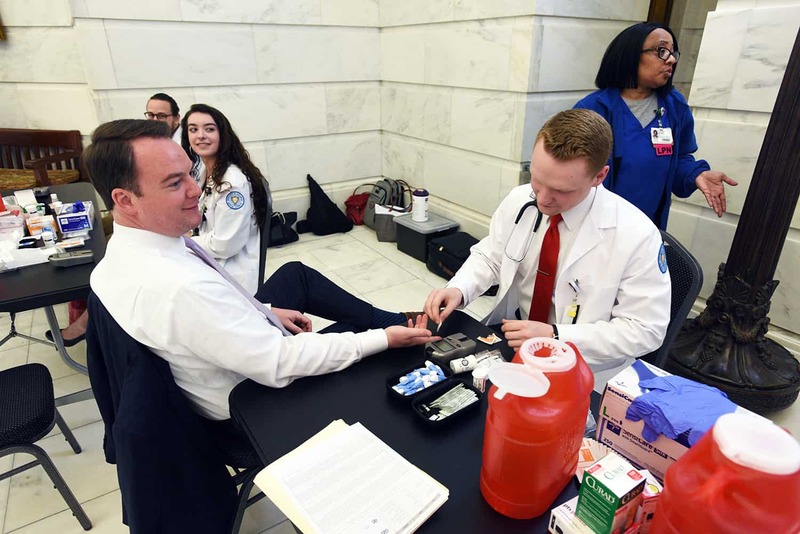 UAMS Students from the College of Pharmacy and College of Nursing provided biometric health screening during UAMS Day at the Capitol. Offered by the Preventive, Occupational and Environmental Medicine (POEM) program at the UAMS Family Medical Center, the biometric health screenings included blood pressure, height, weight, body mass index, cholesterol and glucose. “We provide immediate results and discuss them with each person who is screened. This not only gives important health information to the participants, but offers our students valuable experience in performing these screenings,” said Melissa Vandiver, practice manager of POEM, Student Employee Health and the Student Health Clinic. Students from the UAMS College of Nursing and UAMS College of Pharmacy performed the screenings, with advanced practice registered nurses on hand to interpret results. Stephanie Gardner, Pharm.D., Ed.D., made the short trip from UAMS to the Capitol to receive a screening and support the participating students. Gardner is UAMS senior vice chancellor for academic affairs and provost. “Just like our legislators, UAMS students come from every corner of the state. By participating in the screenings, legislators have the opportunity to meet students from their district and see the impact they are having in the community,” Gardner said. Representatives from several other UAMS programs were on hand to share information and offer demonstrations, including the Institute for Digital Health & Innovation, which delivers health care, reduces cost and improves access through technology such as smart phones, interactive live video, wearable devices and personal computers. To demonstrate the power of digital health, UAMS employees performed ultrasounds using a small hand-held device connected to a smart phone. “This technology is brand new, and we anticipate it to be a valuable tool for many situations,” said Terri Imus, R.N., director of operations for trauma telemedicine. Compared to the approximate cost of about $30,000 for a traditional ultrasound machine, the handheld device costs about $2,000 and can be used anywhere. Representatives from the UAMS Institute for Digital Health & Innovation demonstrate a handheld ultrasound device. “Technology like this will allow us to perform an ultrasound on a trauma patient being transported by ambulance or a pregnant woman in distress before they even reach the emergency room,” Imus said. Laura Hutchins, M.D., interim director of the UAMS Winthrop P. Rockefeller Cancer Institute, shared information about the institute’s goal of achieving designation by the National Cancer Institute (NCI). “We have received tremendous support from the Arkansas Legislature this session and want to express our thanks to the legislators and Gov. Hutchinson for ensuring our ability to pursue this important designation will move forward,” Hutchins said. In addition to providing access to cancer drugs and therapies unavailable elsewhere in the state, NCI Designation also would provide Arkansas with an estimated economic impact of $72 million annually. Several elementary school groups also got in on the action by touring the Mega Brain, an inflatable walk-through exhibit sponsored by AR Saves (Arkansas Stroke Assistance through Virtual Emergency Support), a UAMS-led statewide program. Set up near the Capitol’s entrance, the Mega Brain is an entertaining and educational tool for teaching children and adults about the human brain, stroke and other neurological injuries and diseases. Other areas represented at programs represented at the event were UAMS’ Regional Campuses, Graduate School, College of Nursing and College of Pharmacy’s chapter of the National Community Pharmacists Association.